It all began in 1621. 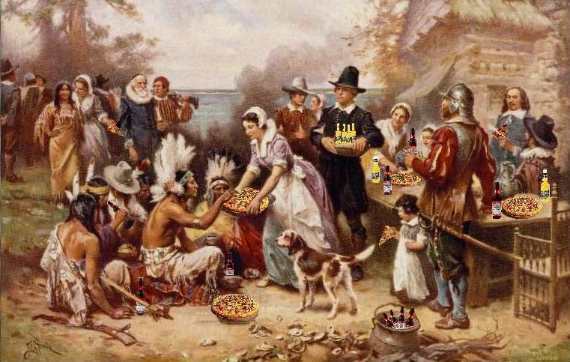 Thanksgiving Poems recall the time when Pilgrims and Wampanoag Native Americans first feasted together to celebrate the fruits of the harvest. The writers at My Word Wizard take a look at this most American of days from a variety of angles. First of all, it is a day to express our appreciation for the bounties in our own lives. It is a time for famiily gatherings and touch football, for gentle ribbing and holiday sales. Most of all, it is a time to gather together, to take stock, and reflect on all we have. One aspect of the holiday we tend to overlook is the importance of the early cooperation between the Plymouth settlers and their Native American benefactors. While we have everything to be thankful for as citizens of a bountiful, prosperous land, it is sometimes amazing to think about how these two culturally and linguistically distinct groups were able to work together towards the common good. Perhaps that is the real lesson of the day. We think and hope you will delight in these precious sentiments that capture both the gravity and the lighter side of the holiday. Funny Poems for Turkey Day : It's the time of year when families gather, parades march down mainstreet, and anything can happen! This collection of delightfully humorous ditties recall the amusing things that happen when we celebrate this special day of gratitude. We hope they bring a smile to your face. More Funny Poetry for Turkey Day : You loved our Funny Poems for Turkey Day so much, we decided to give you some more! The additional collection captures even more of the madcap fun associated with this family celebration. Enjoy!